An email arrived here in the spring of 2004 from a woman in England who said she couldn’t find true stock over there of the daffodils ‘Irene Copeland’ and ‘Mary Copeland’. Might we be willing to sell her some, she asked. Since we don’t export bulbs outside the US, we regretfully declined. But when she wrote back to explain that she was the granddaughter of W.F.M. Copeland, the legendary British breeder of those two classic daffodils, and that she wanted the bulbs to share with her cousins and to plant at the graves of her mother, Irene, and her aunt, Mary, we couldn’t say no! In appreciation, Margaret Leverment shared with us this wonderful photo and bit of family history. “W.F.M. Copeland, my grandfather, had three children: Mary, born 1912; Irene, born 1914; and John, born 1917. They lived in Southampton, in the south of England. He, his wife, and subsequently his children were all committed Christians which I think they would all claim to be the most significant biographical detail of their lives. “He named daffodils after his wife, which he called ‘Mrs. William Copeland’ (in those days apparently it wasn’t the done thing to use a married woman’s Christian name when naming a flower!) and his two daughters, as you know, Mary and Irene, both registered a year after their births, it seems. He was always looking for his best daffodil to name after his son John. There was one he called ‘John Evelyn’ which my mother says he should have called ‘John Copeland’ as he never raised a better one after that. “John was a pilot and was killed in a flying accident in August 1946, just two months after his mother died. He left a widow and two-year-old daughter. “Mary married a sailor, Jack Lycett, who eventually became a captain in the Union Castle line and was away for long periods of time. Mary brought up their four children, and she and John’s widow Lois were a great support to each other. They lived in the Southampton area, Southampton being a major seaport. Mary was very involved with Christian work of one sort or another all her life. “My mother Irene went abroad as a missionary in 1939 to Burundi in central Africa. She was with Ruanda Mission linked to the Church Missionary Society, an evangelical Church of England organisation. There she met my father, Gregory Smith, who was a Church of England ordained minister and they lived after their marriage in southwest Uganda working for Ruanda Mission. My father administered the Mission (subsequently the Church of Uganda) schools, and my mother worked mainly with the local women. Like all missionaries in those days, they had to turn their hand to anything, and life was not easy, no electricity or running water. My mother Irene brought up the three of us, David, Margaret, and Robert. After Ugandan independence when Church schools were nationalised, they eventually came back to England and in the end retired to live in the south of England near Mary, John’s widow Lois, and their families. The sisters and cousins were therefore all close. “Lois died in ‘95, my mother Irene in ‘96. Mary was devastated by her death; there was no one left who remembered their childhood. She used to tell us about going up to London to the Royal Horticultural Society shows and helping her father with the daffodils. It was a huge logistical problem in those days before easy transport. She and my father kept each other going until he died in 2001. Mary was the last of that generation and died in 2003. “Mary had four children, thirteen grandchildren and several great-grandchildren before she died. Many of the family remained living in the area, as did John’s daughter and her two children. Irene had three children and six grandchildren, but no great-grandchildren as yet! “Auntie Mary and my mother were very proud of their daffodils. 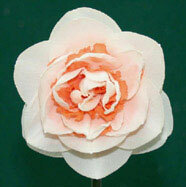 ‘Mary Copeland’ was always thought to be the more beautiful, with its striking orange and white. 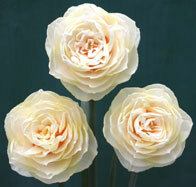 ‘Irene Copeland’ is more delicate and sometimes tends to droop her head in a vase. ‘Mrs. William Copeland’ is lovely, also white and cream, and up to a year ago I still had one or two flowers coming out in the spring. Where Mary and Irene lived the soil did not seem to be very kind to daffodils and they used to always die out after a few years, so I think I am the only person in the family who still has some of each (though I’m not sure about ‘Mrs. W’). “I was amused by your catalogue reference to Mary as “wilder than her sister Irene.” My mother, Irene, was the more intrepid, going to Africa in the ’30s, and in consequence was I think a little less conventional, but in fact the sisters were very alike, even in looks and it was easy to confuse their voices over the phone. The daffodils are less alike but both beautiful. Thank you, Margaret! You haven’t told us too much at all. 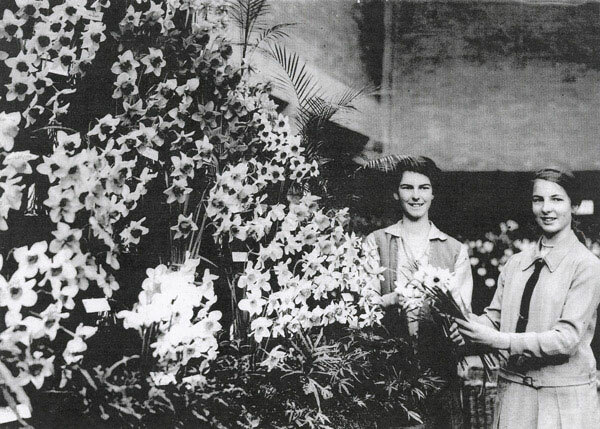 We’ll never look at these lovely old daffodils again without seeing young Irene and Mary and remembering that the flowers in our gardens have come to us from real live human beings. June 2005 update: Margaret wrote to say that our bulbs bloomed beautifully this spring. 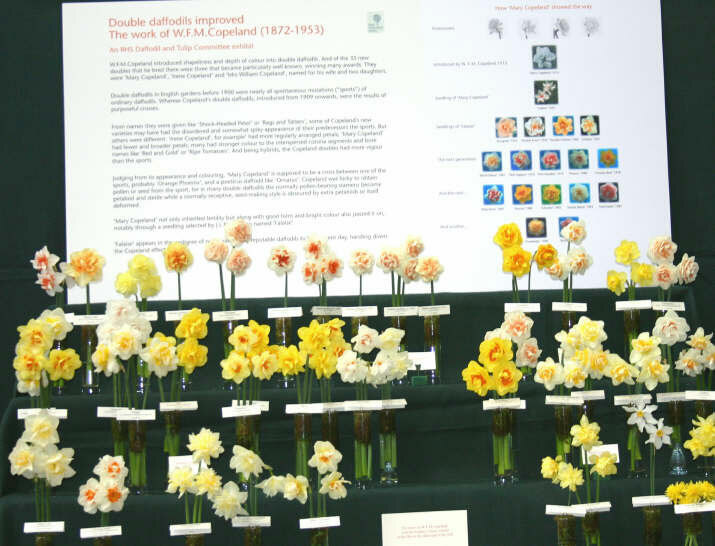 She also told us that the RHS staged a big display of the Copeland doubles and their many descendants at the London Daffodil Show, which you can see in the photo below sent to us by famed daffodil breeder Brian Duncan. Three of Brian’s most exciting new doubles, all descended from ‘Mary Copeland’, are also pictured here. Unfortunately, we don’t sell any of them. They’re all too new!